When Linus Pauling died on Aug. 19, 1994, the world lost one of its greatest scientists and humanitarians and a much respected and beloved defender of civil liberties and health issues. Because of his dynamic personality and his many accomplishments in widely diverse fields, it is hard to define Linus Pauling adequately. A remarkable man who insistently addressed certain crucial human problems while pursuing an amazing array of scientific interests, Dr. Pauling was almost as well known to the American public as he was to the world's scientific community. 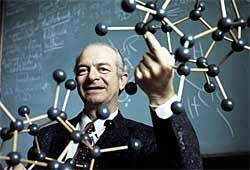 He is the only person ever to receive two unshared Nobel Prizes — for Chemistry (1954) and for Peace (1962). Vitamin CFascinated with the multifaceted role of vitamin C (ascorbic acid) in maintaining health, he began combing the scientific and medical literature for experimental and clinical evidence as to its importance. From published studies, from physiological and evolutionary reasoning, and from his and his wife's own experiences, he became convinced of the value of vitamin C in large doses as a prophylactic or palliative for the common cold. In 1970 he wrote the book Vitamin C and the Common Cold, which became a bestseller and brought wide public attention while creating a huge and continuously increasing demand for this micronutrient. Later he became convinced of ascorbate's value in combating the flu, cancer, cardiovascular disease, infections, and degenerative problems in the aging process. He added other micronutrients, such as vitamin E and the B vitamins, to his list of helpful supplements and published two other popular books and a number of papers, both scientific and popular, on nutritional therapy. As happened during his earlier efforts in awakening the public to the dangers of nuclear weapons, Pauling's pronouncements on the subject of nutritional medicine were often assailed by physicians and physicians' organizations that ignored his long and insightful involvement with the biochemistry of human health and much of the published studies. They often dismissed his ideas as quackery.